Did you know that Toledo once had a district of town called the “Tenderloin”, where vice, sin and corruption flourished with little interference from authorities. It closed down for good on May 1st of 1918, and put more than 8000 “ladies”, gamblers, saloon keepers and musicians out of work? Or did you know that a young Toledo woman, who went by the stage name of Satira, shot her lover to death, a well known Chicago attorney, aboard his yacht in Havana Harbor in 1946? The young and exotic Devilbiss High School grad was sent to prison in Havana and became a local Cuban folk hero, but on October 9th of 1948, she was pardoned by the president of Cuba and returned home to Toledo. Or that on June 27th of 1958, Cyril, the sea lion escapes from a zoo in Canada and is found in Sandusky Bay and taken to the Toledo Zoo. The ensuing conflict between Toledo and London, Ontario nearly sets off an international incident. Or that on March 7th of 1945, a Toledo solider, Alexander Drabik becomes an American hero of World War Two when takes the first Allied steps across the Remagen Bridge over the Rhine River to cross into Germany. 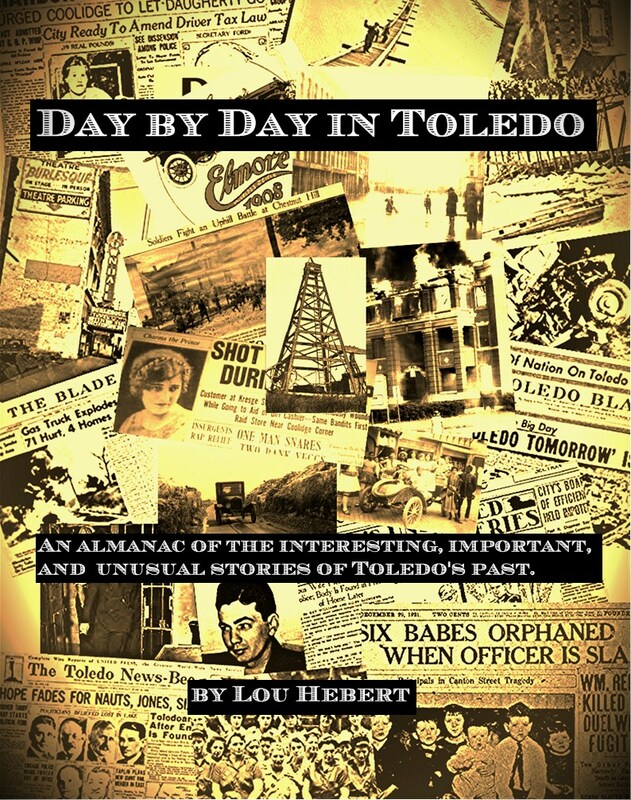 These are but a few of the pearls of local Toledo area history that appear in the book researched and written by Lou Hebert, the creator of the ToledoGazette.com. You’ll not only find thousands of enlightening entries and factoids about the Black Swamp region, but a wide selection of photographs to help illustrate Toledo’s storied past. If you would like a signed copy of Day by Day in Toledo, you can order via Amazon. com, or visit the Toledo Police Museum, or order one directly through ToledoGazette.com by clicking the Buy Now button. Elmer wiilliams is my Uncle. His father Tom Williams was a well known writer and reporter at the Elmer wrote for the Detroit Times when he left Toledo. His brother Ray Williams Detroit news..was the city editor in the 1950’s ..Elmers hobby was making violins which he also played. He was an artist in many ways. Thanks you so much for letting us know about your Uncle Elmer Williams. He must have been a truly unique and remarkable individual and it sounds as if the writing talents were a family virtue. Do you know if Elmer ever wrote a novel or anything other than his columns and news stories?